Great things are happening at the State Theatre! 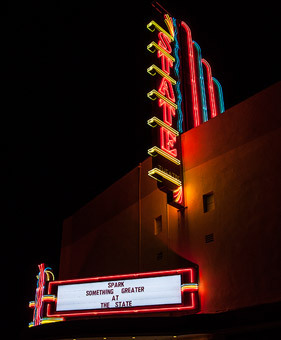 As President of the State Theatre for the Arts, I am extremely happy to report that with the support of the current ownership of the State Theatre, (Ron Clark and Ben Sale Families) the State Theatre has been a hotbed of activity since mid-March, 2011 when STFTA opened escrow to purchase the theatre. eScholar Academy Graduation (Sponsor – eScholar Academy), Reeds Creek School Graduation (Sponsor-Reeds Creek School. State Theatre for the Arts is grateful for the approximately 5,000 citizens of this community who attended and supported these diverse and enriching events at the State Theatre. Thanks to the generosity of theatre ownership and event promoters and sponsors, STFTA has received approximately $20,000 in relation to the above listed events in support of the operation and/or acquisition of the State Theatre. I am also very happy to report that the State Theatre Capital Campaign is proceeding very nicely. Individual and business contributions towards the purchase of the State Theatre have been most generous and more are being received on a daily basis. This level of financial support heartens STFTA and we are pleased to report that thru the generosity of this giving community, our State Theatre for the Arts Acquisition Account is fast approaching $100,000. While we are extremely pleased with our progress thus far we fully realize that the bulk of our “fundraising work” remains ahead of us and we will be seeking support from all segments of the community as we move forward with fundraising efforts to ensure the State Theatre will be providing programming as listed above for generations to come. And one more thing,……….SEE YOU AT THE STATE!